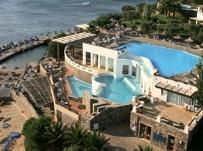 Aquila Elounda Village lies on the shore of the Mirabello Bay in the Beautiful fishing village resort of Elounda. In the colourful Cretan gardens, the whitewashed bungalows slope away from the unobtrusive main building down to the private sandy cove. Breath-taking views over the islands and cascading pools add to the exotic charm of this resort. The famous town is just a short drive away. An ideal hotel with a variety of entertainment possibilities. This hotel is an exclusive couples and adults’ only hotel. Elounda, once a small traditional fishing village, is situated on the Mirabello bay just north of Agios Nikolaos. Across Elounda is the small island Spinalonga, where the runs of an ancient Venetian Fortress provide an exciting attraction for many tourists during the summer months. The village Square is surrounded by tavernas and kafenions.